Healthy choices should taste great! Whether making up a batch of sweet tea or simply enjoying your daily coffee, Pyure&Acirc;&reg; is so tasty and sweet you'll forget sugar was ever an option. <br />Fun Facts about Stevia&acirc;&cent; Stevia is a highly sustainable plant that is part of the sunflower family.&acirc;&cent; Native to South America, the stevia plant has been harvested for hundreds of years and now flourishes worldwide.&acirc;&cent; There are more than 250 species, all with unique traits and flavors.&acirc;&cent; Pyure uses only the sweetest part of the leaf to ensure a consistently sweet and tasty flavor with no bitterness. 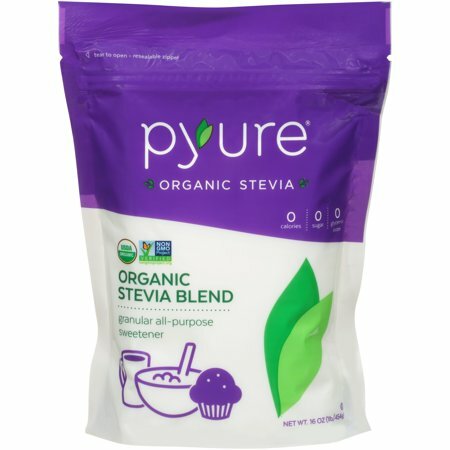 <br />Pyure&Acirc;&reg; tastes great in coffee, smoothies, cocktails, fruit salads, cereal, baked goods, yogurt ...and much more! Healthy choices should taste great! Whether making up a batch of sweet tea or simply enjoying your daily coffee, PyureÂ® is so tasty and sweet you'll forget sugar was ever an option. Fun Facts about Steviaâ¢ Stevia is a highly sustainable plant that is part of the sunflower family.â¢ Native to South America, the stevia plant has been harvested for hundreds of years and now flourishes worldwide.â¢ There are more than 250 species, all with unique traits and flavors.â¢ Pyure uses only the sweetest part of the leaf to ensure a consistently sweet and tasty flavor with no bitterness. It has been three years since I have used refined sugar in my life. This is by far the best substitute available. It is 100% natural, organic and does not cause your body to dump lots of insulin to break it down. You use half of this to refined sugar. I evan use it in baking. If the recipe calls for a large quantity I then add an egg white for volume. I use it exclusively in my cooking and my family doesn't know the difference. I have bought this product twice. It is a small amount for the price BUT you don't need a lot of product to sweeten. A little goes a long way. I am only using it for coffee. I only need 1/2 a tbsp of this sweetener. I was using 3 tbsp of generic Splenda to get the same sweetness. For me there is no after taste. If you want to test the product before buying this bulk package you can buy a box with individual packets first. That's what I did. Excellent sweeter. Use 1/2 of what you would normally use of sugar. Very delicious taste. I was using way too much sugar in my sweet tea. This is a great substitute. I now use pure in place of most other sweeteners. It has a very slight aftertaste when too much is used which is certainly not unpleasant. It's a bit pricey but it's the best I've found. As a type 1 diabetic, I use this product often. It doesn't have the harmful chemicals found in other sugar substitutes. It is as natural as sugar without the carbohydrates that affect blood sugars.